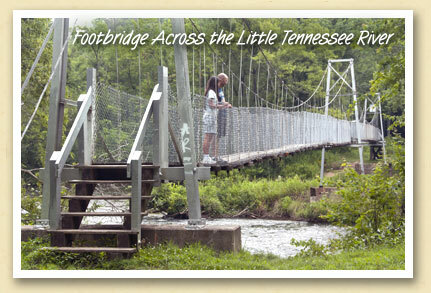 Patricia and James Fields of Crossville, Tennessee explore the 275-foot, double-span Needmore suspension footbridge over the Little Tennessee River. It’s one of two suspension footbridges in Swain County. A smaller one spans the Nantahala River west of Wesser. Suspension bridges were originally built to allow children from local farms to cross the river to catch the school bus in the days before good roads lined both sides of the river. The Needmore bridge is now part of the 4,525-acre Needmore Game Lands, located in Macon and Swain counties and managed by the North Carolina Wildlife Resources Commission. To visit this bridge, from Bryson City drive west on US 74 approximately ten miles. Turn left on Needmore Road at Smoky Mountain Jetboats (just before Hwy 28 North). Continue south on Needmore for about four miles to the bridge. The GPS coordinates are N 35.32544, W 83.52328.